"A tale of war and peace... of triumph and tragedy... of hope... of love... and of courage! 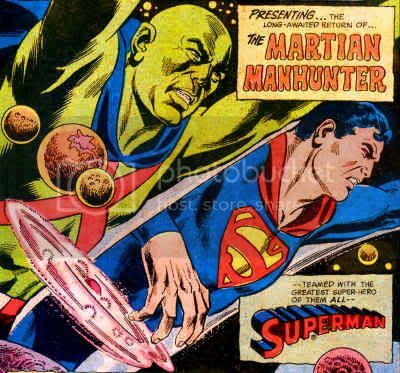 Presenting... the long-awaited return of... the MARTIAN MANHUNTER-- teamed with the greatest super-hero of them all-- SUPERMAN... Prepare to stretch your imagination... from here to a star in a galaxy so distant it appears in our telescopes as no more than a faint pinpoint of light... where a desperate group of refugees battles matchless evil to the cry of-- '...AND SO MY WORLD BEGINS!'" Superman had continued to investigate the alien building in the Utah Salt Lake that appeared and vanished mysteriously. "The last time I saw the structure, it showed up at precisely this spot-- and I could've sworn my long-lost friend, J'onn J'onzz, was inside! Which isn't likely-- because he's somewhere in intergalactic space, seeking his fellow surviving Martians!" As though a mirage, the Alien Arsenal came into view, before solidifying. Superman entered, but there was no light inside save pale illumination from a window, affording him the sight of a familiar silhouette moving toward him. "J'onn J'onzz! How are you--? How about an Earthly handshake..? Give me your hand..." ...and he surely did, right across Superman's kisser! 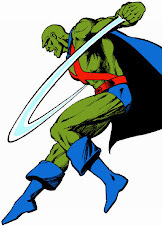 Knocked backward into otherworldly artifacts, Superman thought, "People used to wonder if the Martian Manhunter could throw a punch as hard as I can! Judging from the condition of my jaw, the answer is a definite yes! But the big question is... why? What possible reason could J'onn have for trying to dismantle me? Maybe the answer to that is in his eyes-- They're wide... with madness! He's crazed... doesn't know what he's doing!" 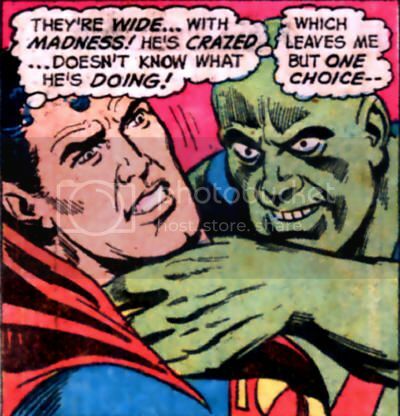 Superman sidestepped the Manhunter once, only to have the Martian Marvel rebound, and squeeze the Man of Steel around the throat. Left with no choice but to fight back, Kryptonian muscles batted the Alien Atlas' arms away, then delivered a left hook that dazed a friend turned foe! "We could probably slug each other all century! On Earth, we're both super-powered! So I'll have to try being smart instead of merely strong! The Batman showed me this judo trick... a sleeper-hold! --If Martians are constructed anything like humans-- it should end our brawl!" A tremor more violent than an earthquake shook the vaulted hall, as it suddenly traveled to another world! "I'm being shaken loose!" As the arsenal settled, Martian Manhunter struck for the final time. "Wetness on my lip...! I... I'm bleeding!? J-J'onn's fist cut me! How--?" As Superman marveled at his wound, J'onzz seemed to come to his senses. "Superman! Am I dreaming... or are you real?" The reply, "I am, J'onn... including my blood!" "I... I'm sorry! I thought I was having a nightmare! I wouldn't have... hit you otherwise! --I thought you were either a living nightmare... or one of them! ...The Thythen! --The fiends destroying the last pitiful remnants of my people! --The unholy trinity preening out there-- bathing in the sunlight!" The pair of heroes looked out through the structure's massive doors, where Superman found the answer to another of his questions. "Ummm... a red sun! Which means I'm back to normal... no super-powers! At least... I'm usually my regular Kryptonian self beneath a red sun!" Kal-El punched a wall to check, the only effect being rapped knuckles. "Yeah... ordinary! Look, J'onn... maybe you'd better give me your story! Begin at the beginning... As I recall, your people fled Mars after the planet was devastated by global war..."
"Yes... and I followed them... I bid farewell to you and the other members of the Justice League and sped toward the stars... The alien ship I was piloting was equipped with devices to detect ionized anti-matter, the fuel my fellow Martians were using... While following the trail into a space-warp, I was hurled into a distant galaxy... where, on the far side of the warp, I again found the trail-- leading to this world! ...After landing, I saw a huge framework and crept close... and was struck numb with sheer horror-- My people were captive... hung like sides of meat on a rack-- alive but unconscious! Helmets were attached to their heads-- and worst of all... they were connected to gigantic monstrosities... Things I guessed were combination androids and machines... obviously designed for war! As I strove to understand, I was spotted-- and chased... I sought refuge here... reached the building just as it was vanishing! Otherwise, I would surely have been destroyed!" 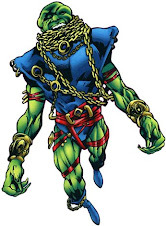 From a tablet he had found, Martian Manhunter learned he had been on the planet Vonn, that he was traveling inside an Alien Arsenal that was being sent to various points in space, that his people's captors were the Thythen, and that they were being used to power war machines called Robo-Chargers. Overwhelmed by all this terrible information and horrific circumstance while trapped inside the arsenal, J'onn J'onzz seemed to go a little mad. Superman thought, "Poor guy! He's obviously exhausted... half crazy with worry! No wonder he mistakenly attacked me!" Finally returned to Vonn, Manhunter was resigned to a suicide mission. "Tonight-- when the sun sets-- I'll attempt a rescue! Chances are I'll fail-- but if I didn't try, I'd be as good as dead anyway!" Superman declared, "You won't fail-- neither of us will! Together... we'll lick 'em!" Manhunter felt this wasn't his fight, and couldn't ask his friend to risk his life. "Listen... either accept my help-- or walk over my body!" Manhunter conceded, "All right, Superman... I know better than to argue with you! I'd hoped to use some of the native weapons! But most of them are beyond my comprehension-- and those that aren't, we wrecked in our combat!" On the plus side, the Alien Atlas had some super-powers. "The atmosphere of Vonn affected them! I'm a bit stronger than on Mars... I have limited flight... Fair muscle-strength... No invulnerability!" J'onzz also still had the ship which carried him from Mars. Viewing the Thythen camp from a distance as the red sun set, Superman stated, "I'm beginning to get the glimmer of a plan! It'll be a variation of the old Trojan Horse maneuver-- using your spacecraft instead of a giant wooden steed! ...Since you can fly unaided-- and I can't... You'll have to give me a crash course in piloting this rig!" Having done so, both men were startled by a voice coming from behind the cockpit. "Hello! Is anyone in there--? J'onn! Is it you?" Standing at the entrance was the lovely Bel Juz, who embraced her fellow Desert Dweller. "'O J'onn! Thank Vrom you've arrived! ...I managed to escape the Thythen! J'onn... it's been horrible! Our minds... our souls... feeding those machines!" 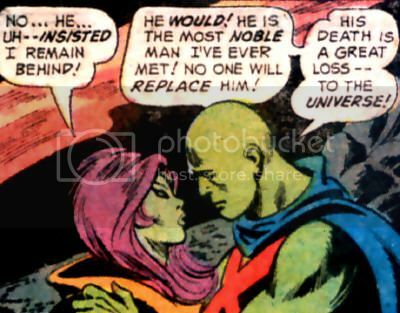 J'onn held Bel for a time, until being reminded of another presence. "Forgive me, Superman! You two haven't met! 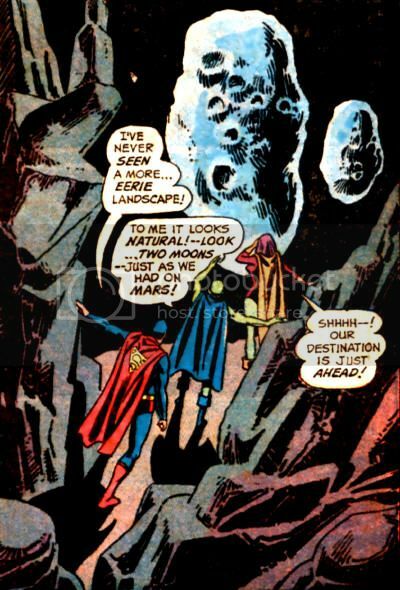 Bel-- meet my friend from Earth..."
Superman thought it might be best to reverse Bel Juz's escape route to gain entry to the Thythen camp, and not knowing how long the night would last, the trio set off. Manhunter confessed, "I may not be up to moving quietly... after all the months I spent in space! I'm feeling tangle-footed!" Bel praised, "You were wonderfully agile fighting Superman!" Manhunter was no braggart. "But... I didn't win, did I? --Still, thanks for the compliment." Superman found the landscape eerie as the trip trekked through mountainous terrain, but not Manhunter. "To me it looks natural! --Look... two moons-- just as we had on Mars!" Bel shushed the pair as they neared a tunnel entrance, at which point Superman demanded J'onn stay behind. "Because I said so! --I insist! It'd be stupid for the three of us to go blundering on! J'onn-- hide in the ditch! And stay there... till you get a signal to act!" J'onn did as he was told, but stammered, "Y...you sound like a tyrant!" 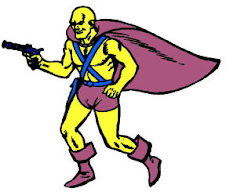 Superman hated to snap at his Martian friend, but was confident Bel Juz was a traitor, and was afraid J'onn might not listen to reason when he tried to turn the tables. "Uh... Bel! Go ahead of me! I'm feeling a bit... uh... uneasy!" Bel thought it might be cowardice. "Very well... you can hide behind me!" 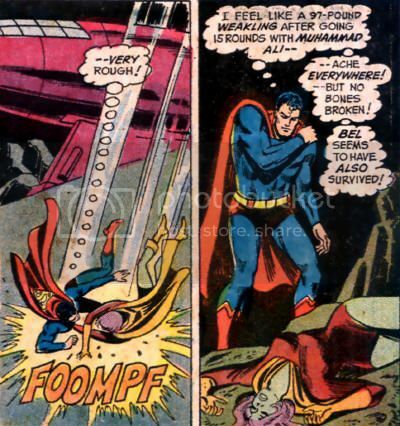 As gently as possible, Superman applied a sleeper-hold on the "feminine Benedict Arnold!" Bel inadvertently began to fly up as she struggled against Superman. 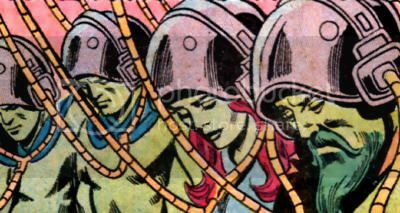 "J'onn didn't say how the Martians fell into the hands of the Thythen! You led them to the trap-- as you tried to lead J'onn and me! You gave yourself away when you mentioned our fight-- which you couldn't have known about if you'd just escaped... as you said!" Sure enough, an armed Thythen could be seen from their now elevated height, lying in wait. Bel Juz finally passed out, and the pair landed roughly back at Manhunter's spaceship. "I feel like a 97-pound weakling after going 15 rounds with Muhammad Ali-- ache everywhere! --But no bones broken! Bel seems to have also survived! She'll be asleep for a while-- long enough to either free the Martians-- or learn we can't-- in which case we'll probably be dead!" Superman flew the spaceship to where he'd left the Manhunter, to whom he called out his intention to create a diversion, and ordered to follow up by entering the camp alone. 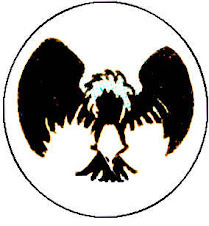 The Man of Tomorrow piloted the craft in a kamikaze dive on the Thythen headquarters, shattering the dome with its impact as flames erupted out the exposed top. 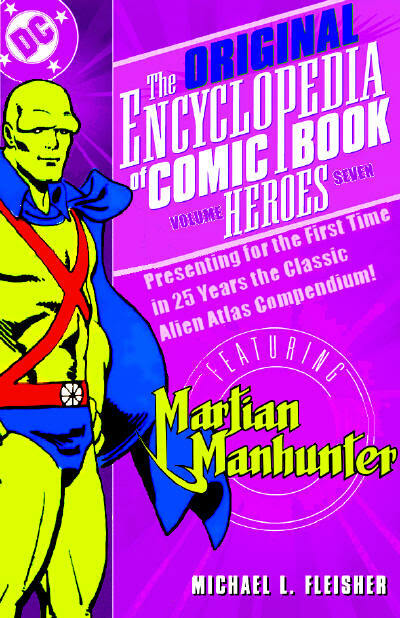 The Martian Marvel, "half-leaping, half-flying," followed through with contingent action. "...I didn't expect him to do that-- to give his very life! Nobody could have survived such a crash--! I vow his sacrifice won't be in vain! ...I'll avenge Superman! The Thythen will pay--!" Manhunter ripped loose the cables that bound his fellow Martians, as two of the three Thythen climbed out of the shattered dome. "The Martians are responsible for this outrage! Somehow-- they are responsible!" "Yes-- and will be responsible for naught else! Robo-Chargers-- attention! Attack the foreigners-- grind them to dust!" However, the Chargers turned on the Thythen rather than the Martians. Circling the pair, the Robo-Chargers' projectors disintegrated their former masters. 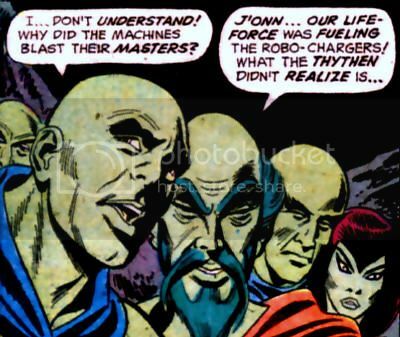 Manhunter couldn't understand it, but a bearded Desert Dweller explained, "J'onn... our life-force was fueling the Robo-Chargers! What the Thythen didn't realize is... that in putting our life into their forms, they put in our souls... our consciousness! We became the machines... and they us! It was we-- alive inside the machines' bodies-- who vanquished our enemies! It is good! They will be useful... for rebuilding our cities-- our civilizations-- on this world's soil. No more will they destroy! Rather... they will create!" "J'onn... darling!" J'onzz was surprised as Bel Juz raced into his arms, having thought she may have been killed while with Superman. "No... he... uh-- insisted I remain behind!" 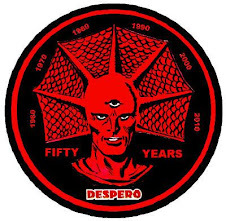 A mournful Manhunter acknowledged, "He would! He is the most noble man I've ever met! No one will replace him! His death is a great loss-- to the universe!" Just then, from out of the flaming wreckage, the Man of Steel was climbing out of the wreckage. "I'm lucky... to be alive! That was quite a jolt! I wouldn't have made it... without this fire- and shock-proof suit I found in the spaceship's locker! I'll find J'onn and clue him to Bel's treachery--" The remaining Thythen had also survived to warn, "Prepare to perish-- You brazen fool! Dare our wrath, do you? I will squeeze you to a pulp, frail one!" Superman raced from the towering monster toward the weapon museum, quite a respectable jaunt. Kal-El stumbled at the door of the Alien Arsenal, allowing the Thythen to seize him. Just then, the structure made another trip "across the wastes of the galactic void-- to come to rest in bright... yellow sunlight... of Earth!" Superman's strength immediately returned, and he made short work of the Thythen. "The museum is smashed! It'll go nowhere-- not in that condition! So for me it's over-- a happy ending! And I hope for J'onn J'onzz and his fellow Martians-- a happy beginning!